University of Southampton archaeologists leading a major excavation of Portus, the ancient port of Rome (see www.portusproject.org), have uncovered the remains of an amphitheatre-shaped-building, solving a mystery which has puzzled experts for over 140 years. 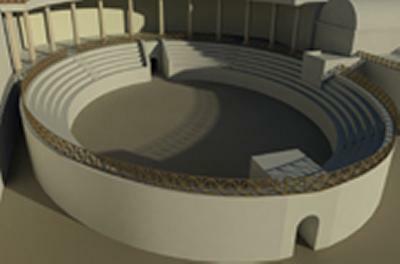 “When the site was visited by archaeologist Rodolfo Lanciani in the 1860s he marked on his plans the remains of a theatre, but subsequently no trace of the building could be found,” says Portus Project Director and leading expert in Roman Archaeology at the University of Southampton, Professor Simon Keay. Funded by the Arts and Humanities Research Council, experts from Southampton have been working with colleagues from the BSR, The Italian Archaeological Superintendency for Ostia and the University of Cambridge, to carry out extensive excavation at Portus. They have uncovered a large Roman warehouse, the ‘amphitheatre’ and what the team have identified as an Imperial palace. This is likely to have played host to renowned emperors such as Hadrian. Portus was Rome’s gateway to the Mediterranean for most of the Imperial period and played a key role in funnelling food, slaves, wild animals, marble and all manner of luxury goods from across the Mediterranean and beyond to the citizens of Rome. It was vital to the survival of the Empire and the only real ‘transport hub’ serving the city. “The ‘amphitheatre’ we have discovered was similar in ground area to the Pantheon in Rome, but it is unclear exactly what it was used for,” continues Professor Keay. 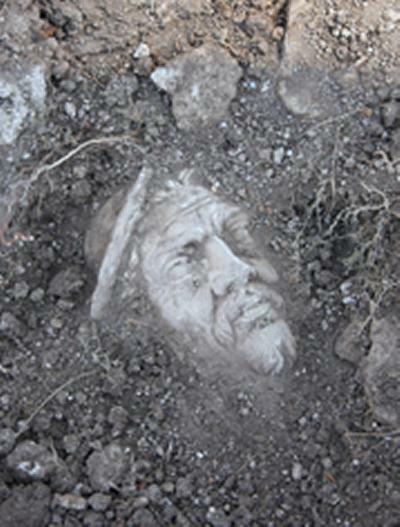 Having solved one riddle, archaeologists have now uncovered another; the white marble head of a statue unearthed at the site of once-luxurious rooms close to the ‘amphitheatre’. 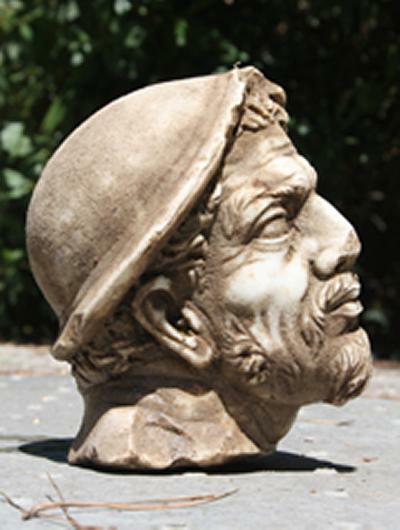 It is thought the head dates back to the 2nd or early 3rd century, however it is less clear who it depicts. 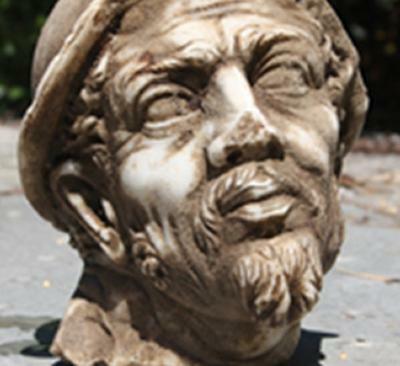 “The elderly bearded male wearing a flat skull-cap could suggest it is Ulysses, however it is equally possible it is a representation of one of the Greek sailors who accompanied him on his travels. For the moment his identity remains a mystery,” concludes Professor Keay. Part of the ‘Portus Project’ involves the work of the University of Southampton’s Archaeological Computing Research Group. They are producing computer generated images which bring the port to life and provide archaeologists with a valuable ‘tool’ with which to explore the site. The University of Southampton and the BSR are jointly using ground-penetrating radar and other techniques to map buried buildings and other structures. The Portus Project has also been undertaking a geophysical survey of the Isola Sacra, an island to the south of Portus, and has found a major new canal and traces of Rome’s marble yards. Research has been underway at Portus for several years and Professor Keay hopes to continue working there. “This is one of the most important archaeological sites in the world,” he says. For a variety of visual representations of Portus including graphics, simulations and texture mapping, see www.portusproject.org/visualising/. School of Humanities, Archaeology website: www.soton.ac.uk/archaeology/. 4) The British Academy is the UK’s national academy for the humanities and social sciences. Its purpose is to inspire, recognise and support excellence and high achievement in the humanities and social sciences, throughout the UK and internationally, and to champion their role and value. The Academy is the sponsor and principal funder of the British School at Rome. 5) The University of Cambridge has long been a major centre for the study of the classical world. Today its Faculty is recognised internationally as one of the most dynamic departments of its kind, with an exceptionally distinguished record in teaching and research. Its work covers literature, philosophy, history, art, archaeology, linguistics, philology and a wider range of interdisciplinary studies. Further information and a comprehensive list of staff and resources can be found at www.classics.cam.ac.uk.